For the last few years, Vogue Magazine has created a viral sensation of sorts with a video series dubbed "73 Questions," created by Joe Sabia. The videos feature a rapid-fire series of, you guessed it, 73 questions, with celebrities such as Reese Witherspoon, Daniel Radcliffe and Olivia Munn taking part in the series since it launched in 2014. Today, Vogue is back with a new installment, where they turn the camera on Derek Zoolander (Ben Stiller) himself for Zoolander 2. The video also doubles as a tour of Zoolander's lavish apartment, complete with a massive gym, as he reveals what his favorite movies and TV shows are, and much more. Zoolander 2 centers on Derek Zoolander (Ben Stiller) and Hansel (Owen Wilson), who are recruited by Valentina (Penelope Cruz), an Interpol agent and former swimwear model, to stop a deranged killer who is targeting the most beautiful people in the world. The first trailer revealed that this assassin starts his killing spree with none other than pop star Justin Bieber, who was revealed in a set photo posted by star/director Ben Stiller back in April. Other celebrities this killer has bumped off include Usher Raymond, Demi Lovato and Miley Cyrus. 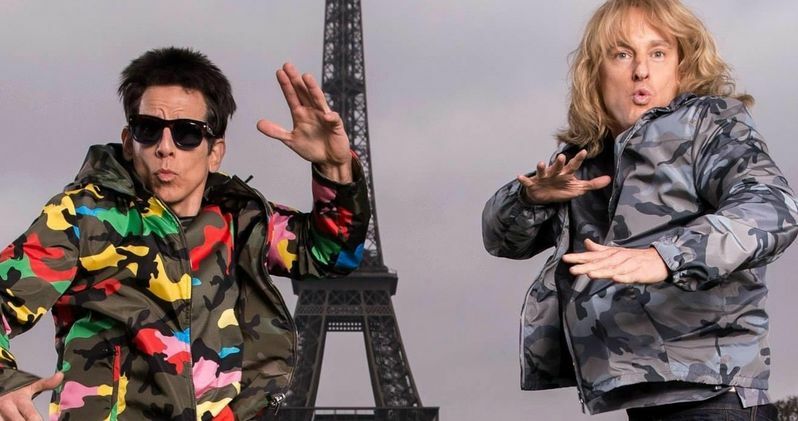 Original Zoolander stars Will Ferrell (Mugatu) and Christine Taylor (Matilda Jeffries) return, along with new additions such as Cyrus Arnold, Fred Armisen, Kyle Mooney and Kristen Wiig. The story is set a decade after the first comedy, with the story picking up after both Derek and Hansel have left the fashion world behind. Now they are tasked with saving the world's most beautiful people, but they'll be going up against one of their former friends. Kristen Wiig stars as the new villain Alexanya Atoz. As we learn in the first trailer, she is soon teaming up with the only criminal mastermind who could possibly be behind the entire assassination plot, none other than Will Ferrell's Mugatu. Billy Zane, who portrayed himself in the original cult classic, will return again as one of Derek Zoolander's good friends. The first trailer set a new record for comedy, with the footage amassing a whopping 52.2 million views in just one week. Ben Stiller also directs the sequel from a script by Justin Theroux, who wrote the script for 2008's Tropic Thunder, which Ben Stiller also starred in and directed. Production took place earlier this year at Rome's famous Cinecittà Studios, with production spanning 12 weeks. Zoolander 2 will be going up against 20th Century Fox's superhero movie Deadpool and the Warner Bros. comedy How to Be Single on February 12, 2016. Take a look at Derek Zoolander offering his answers to Vogue's 73 Questions in the video below, and stay tuned for more on Zoolander 2.